Apple is preparing an aggressive brick-and-mortar retail expansion into Latin America that will see new Apple Stores open across Mexico and eventually South America, to be led by two massive outlets —one a flagship —in Mexico City, according to a source familiar with the matter. The first facet of Apple's plan is to break ground on a large mall location in Via Santa Fe, the upscale wing of Mexico City's Centro Santa Fe complex, a person who wishes to remain anonymous told AppleInsider. Apple SVP of Retail Angela Ahrendts just recently made the deal official by signing a lease, though construction on the "next-gen" Apple Store design was already underway, the source said. The Via Santa Fe Apple Store will be the first to open in Mexico and only the third official Apple outlet in Latin America. 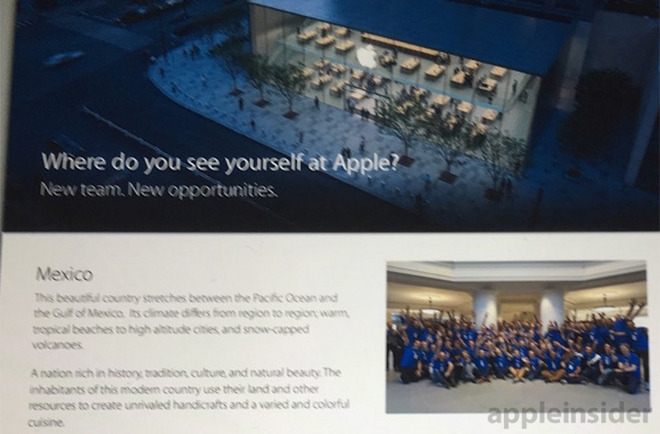 Aside from multiple country-specific online storefronts, two physical Apple Stores are currently in operation in Brazil, which the source said served as a testing ground for an upcoming wave of openings in the region. A second Mexico City outlet is being planned as a large standalone structure strategically positioned in an affluent shopping district, a build on par with recent international flagship stores in China and U.S. counterparts like the Union Square store in San Francisco. There is no information on when the Mexico City locations are expected to open, though both will be completed within a year of each other. As seen in the image above, Apple is assembling a team from its existing workforce to spearhead the Mexican retail project. Apple was last rumored to be plotting an entry into Mexico in 2007, when company representatives were supposedly negotiating a lease for space in Mexico City's Torre Mayor office building. Looking further ahead, plans are to expand out of Brazil and into neighboring countries like Argentina and Peru, while Chile is also in Apple's sights. Ahrednts is looking to breathe new life into Apple retail. The executive is pulling in ideas from all ranks, including CDO Jony Ive and SVP of Internet Software and Services Eddy Cue, who were among the many collaborators on a new architectural design language Ahrendts hopes will serve as a catalyst for a more engaging Apple Store experience.